Every dog owner knows that dogs love their treats. Receiving a treat after an activity makes play far more rewarding and engaging for dogs, and helps to strengthen the bond between pet and owner. 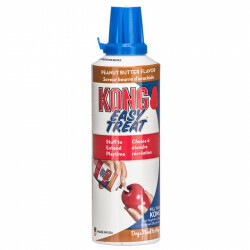 With paste treats for dogs, owners can turn otherwise normal toys into treat-dispensing activities that reward their dogs' problem solving skills and active play. 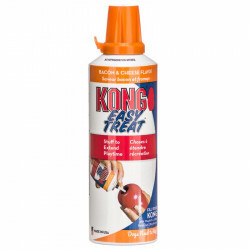 Paste treats are squeezable or sprayable, edible pastes that fill certain toys with delicious flavors dogs can't resist. This is a fun way to make playtime even more enjoyable for your pet. Pet Mountain's Paste Dog Treat store features quality paste treats from the leader in practical, unique and innovative dog toys and treats: Kong. 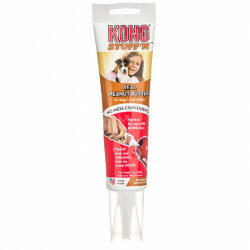 Kong Stuff'n paste treats are designed specially to fill Kong's own durable chew toys, but may also be used with any fillable dog toy. Kong Stuff'N Easy Treat Peanut Butter Flavor Paste makes it easy to stuff a tasty treat into any Kong Chew Toy with a hollow center. Simply insert nozzle tip into opening at base of toy and press to fill toy full of the tasty, flavored paste. Kong Stuff'N Real Peanut Butter makes it easier than ever to fill your Kong toy with real peanut butter! 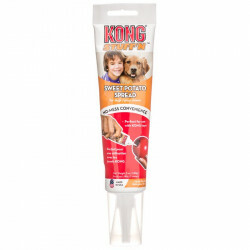 Kong Real Peanut Butter is also perfect as a training treat straight from the nozzle  a little dollop is all you need. No refrigeration required. Kong Stuff'N Easy Treat Liver Recipe provides the same benefits as Kong's other paste dog treats, but this time with the irresistible liver taste that dog's can never get enough of!